Do you have child that loves to read? 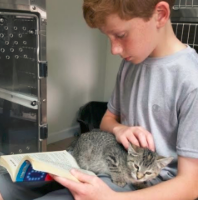 Children (ages 5+) are invited to the shelter each Saturday from 1 pm to 4 pm to read to the cats in our adoption room for 15 minutes at a time. The program will help children improve their reading skills while also helping the shelter animals by providing socialization and human interaction. Reading will take place at the Starkville Animal Shelter. To volunteer, contact Christy Crenshaw at 662-338-9093 to schedule a time to read. Log in to see who is volunteering for Book Buddies!